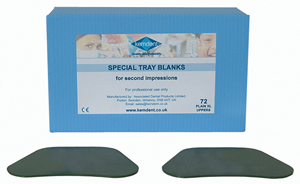 Kemdent Shellac Special Tray blanks are a firm favourite with Dentists and Technicians. Quick and easy to adapt by flame or hot water to produce individual custom trays for the most accurate impressions. Kemdent Shellac Special Trays Green are available in both plain and perforated uppers.